One of my best memories was going to the stock car races with my father in the summer. They were usually local events and held on dirt tracks. My dad always got me a cheeseburger and orange crush. To this day the taste brings me back 40+ years. 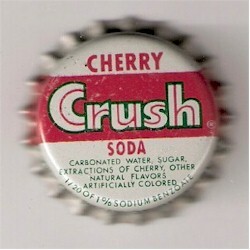 I worked in a small family owned grocery in the 70's that carried all the Crush flavors. I liked Orange best. Faygo made the best strawberry soda. They call it Redpop. Crush made the best orange soda ever.